Currently residing in one of the four bathtubs in this house are four newborn baby ducks. They are the cutest things ever. After three weeks they will be moved outside to the new chicken coop. They will be used for eggs and for free slug control in the garden. And fertilizer. The chicks should be hatching tomorrow. I hope I did the html coding right to post this photo. The one in front and to the left is Sir Pecks-a-lot. The others don't have much personality yet so we're waiting on names for them. They are so cute, take good care of them! Ah! I'm so jealous. I want ducks but I live in the city limits and I'm not allowed. And my one sour-puss neighbor would totally tell on me. How adorable! Are they also under a heat lamp to keep them warm? My Duvall friends tell me that they've gotten a lot of great advice on some of the homesteading forums with their poultry. They've been raising chickens, muscovy duck, geese. 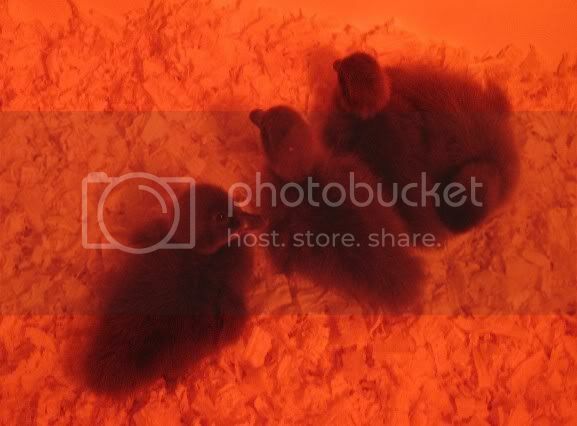 Yes, they are under a heat lamp. That is why the photo is orange, from the color of the light. I raised baby ducks 3 times and am lucky enough to live on a creek which they enjoyed.